RIFT updated the Public Test Shard (‘PTS’) on 17th July with an ~120mb update! TEST-302-95-A-1021937. Relatively small update, although there’s a new warfront and dimension tiles. There’s a new warfront on the PTS: “Assault on Bronze Tomb”. It sounds like it might be a warfront version of Iron Tomb, although there’s no preview picture and there weren’t enough players on the PTS to test it out. The text clearly shows you will need to switch sides – between attacking or defending ‘strategic capture points’. The “As one falls, more will open” is rather interesting, suggesting that the defenders will need to fall back to different defensive points throughout the warfront. “Be wary of traps” clearly implies there are traps scattered throughout. It will be interesting to see if these traps are already set in the warfront, or if the defending team can drop traps wherever they choose. I’ll be organizing a playtest next week hopefully for a new PvP feature, if you like PvP I’d love to see you there (assuming the timing works of course). 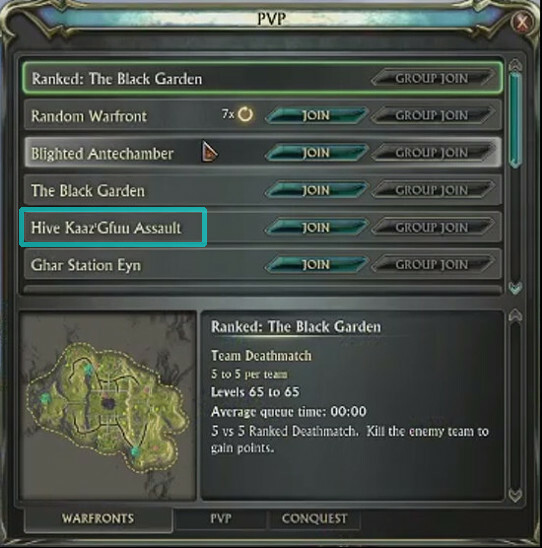 Some of you probably remember that Trion accidentally revealed “Hive Kaaz’Gfuu Assault” in a previous livestream when showing off public Elo ratings. It’s unknown at this stage whether Trion has scrapped the Hive Kaaz’Gfuu map for this new ‘Assault on Bronze Tomb’, or if Hive Kaaz’Gfuu Assault will pop up on the PTS at a later date. Not much is available other than the above except for some data files – no models though. “fort_stone” might be the internal name for Iron Tomb, and it’s clear “Bronze Tomb” is using an existing dungeon from the filepath. ‘funnel_ghost’, a beam-knockback and ‘mech_barrier’. Again, not much to go on but perhaps the ‘beam-knockback’ is one of the ‘traps’, perhaps to knock a player down to a lower floor (back to a previous room). The warfront will probably also have the below text that was found in a previous update. PvPers should look forward to a PTS playest of “Assault on Bronze Tomb” ‘possibly’ next week! It seems that dimensioneers will be getting a larger range of building block tiles. These are not up on the PTS’ RIFT Store yet. This is in line with what Morticus and Vladd mentioned with The Dimension Touring Company back during the DTC Roadshow Livestream on 4th April 2015. They talked about adding a variety of new building block colors as well as new ‘disc’ building blocks. The Dream Hive dimension key is aimed for a 3.4 release date. Morticus posted an image preview here. It seems that Trion have now added the dimension key into the PTS client’s files, although I have not been able to find it in-game. It seems the dimension will have various waterfall sounds throughout. The pink “Ascended” rarity that has appeared on Live with the Ascended Mantles (from the Power Pack found under RIFT Store -> Services) seems to be known internally as ‘Heirloom’. Nothing amazing, but just an fyi. Numerous files refer to it, and it always appears after the ‘transcended’ rarity, so that’s probably what the higher rarity is called. This might just be something that exists for a quest, or perhaps a relic of pre-launch RIFT. There seems to be sound files for “ITEM_REPAIR” and “Play_ui_repair_item”. Could we potentially be getting some sort of breakage/item depreciation system? Again, could just be something that is in the files from pre-launch RIFT and was simply never removed. Not much in the latest PTS Update given how close it was from 3.3 release, but there might be a PvP Playtest for the “Assault on Bronze Tomb” warfront coming next week, so keep an eye out for that! Yeah. I was hoping Bronze Tomb could be a questing area or dungeon (and I suppose it could still be, at some point in some way, but looks less likely now). Maybe this could be part of a gradual tie-in between the Eth and Brevanic peoples and something new?